Since today is the beginning of a new year, we are beginning a new feature that we’re calling The Morning Constitutional. It will be a daily topic or question or happening that we will write a few words about so that you’ll have something to read first thing in the morning. If you ever have any topics or questions you’d like covered, go ahead and let us know in the comments below. You can also email us or simply post it on the message board. Today’s Edition: What to Make of Tate Martell’s Take on Transfers? 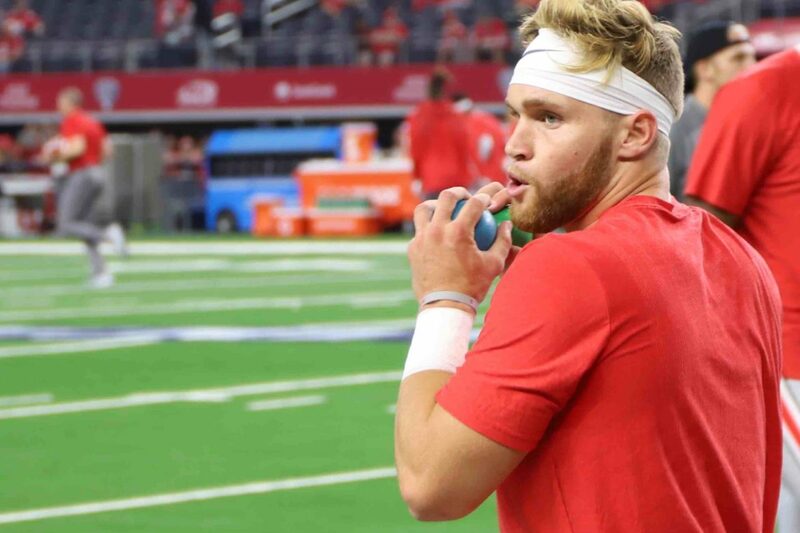 At Sunday’s Rose Bowl Media Day, the credentialed reporters in attendance were able to speak with just about anybody on Ohio State’s two-deep, which finally included redshirt freshman quarterback Tate Martell. It was probably the first time he has been available to the media since early in the season. Following the Big Ten Championship Game win over Northwestern, the OSU locker room was open for reporters, but Martell was nowhere to be found. Martell is always open and honest and usually has something to say, which is why he was a hot commodity on Sunday. And he certainly didn’t disappoint. Asked about the possible addition of a transfer quarterback such as Georgia’s Justin Fields, Martell said it wouldn’t change how he operates and that he’s been an underdog his whole life. “I have no problem going out there and taking the job,” he said, speaking exactly as you want a prospective starting quarterback would do. Then when asked about the thoughts that he may transfer out if somebody transfers in, he gave everybody exactly what they wanted to hear. Martell’s definitive nature is precisely the kind of confidence a team needs in their quarterback, and his willingness to compete for the job is what a competitor would do. Even though he is leaving, one of Urban Meyer’s most important quarterback qualities is competitiveness, and if Martell didn’t have that, he wouldn’t have been a Buckeye. Martell realizes that Ohio State needs more quarterbacks and he is fine with that. Competition makes everyone better and he sees the addition of Justin Fields as something that will only make him better. Everything Martell said on Sunday about the quarterback competition is what Buckeye fans should want to hear. He believes he will be the starting quarterback next year if Dwayne Haskins leaves early for the NFL, and not because he’s simply next in line, but because he is the most qualified candidate for the job and he knows the offense better than anyone else. Knowledge is power and if Haskins leaves, no quarterback will have more power than Martell. As we have seen in the past, the understanding of the offense and ability to move the ball is more important than having the biggest or best arm on the team. Ryan Day is going to want the quarterback who gives the Buckeyes the best chance to win. Tate Martell believes that is him, which is what you want all of your quarterbacks to think. Then it is simply up to them to perform and convince the head coach who is correct. Martell is confident that he will be starting next year because he is confident in his command of the Ohio State offense. He is also confident in himself, and that has always been one of his biggest strengths. Tate Martell is a supreme winner. That is all you need to know. You will be glad he is the starter next year when he puts the offense on his back and wills the team to win. In the toughest of games. That’s what the few true winners like Martell do. Martell reminds me of.another guy who had a lot of detractors over the years…Drew Brees. Tate acts like he’s entitled to the position…there is a difference between confidence and arrogance…Is he forgetting Baldwin??? Not against the greatest of competition but nobody else has done it before even against weaker teams. I’m no Martell fan. I like his confidence and aggressiveness, but I just haven’t seen the ability to lead this team like Haskins or Barrett did. I think Fields might be the next guy to fit the OSU system and he may well be able to beat out Martell. So let’s go get him!! I hope the confidence is well-founded!! I think it would be GREAT if Tate was able to step-up and keep the Buckeye offense moving forward. But I don’t recall seeing anything (on the field…) this past year to give me a ton of confidence that he is the man to step into the big shoes of tOSU quarterback slot. I agree that the play calls for him this past year were terrible; no chance to really show anything. But were those plays chosen because that was the limit the coaches felt he could handle on the field? I know that the coaching staff raved about him during the fall…but I tend to take more from what those coaches DID in games than what they SAID to the public. I don’t know. I’m rooting for Tate. But I’m not convinced he’s ready. Tate is not the future of Buckeye football. Unless our future is full of regret. I just hope the coaches use Tates skill set better next season than they did this season. The play calling was so awful, it was almost like they were trying to achieve failure. Kevin: Or at least trying to make sure everyone wanted Dwayne instead and not generate a QB controversy?